Elisabeth Kolbert: The Sixth Extinction. Published on Feb 2014 by Henry Holt & Co., New York. 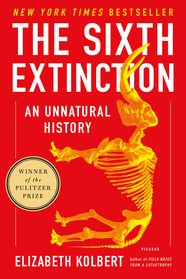 The 2015 Pulitzer prize in the General Nonfiction category (awarded on May 28) went to Elisabeth Kolbert for her book on science of extinction, which also happens to be an intro to conservation biogeography. The book has a wide scope stuffed to 220 pages of swift prose, covering the deepest paleontological past as well as the very present, dealing, among many other things, with mainland forests, coral reefs, and processes such as species invasions, ocean acidification, or habitat loss and fragmentation. Each chapter builds on conversations with experts, often set directly in their working environment – Kolbert interviews researchers while hunting for extinct frogs in tropical forests, exploring caves of upstate New York, or fighting her way through rising tide on an atol. The conversations are intertwined with historical accounts and explanations of theoretical concepts, often zooming in and out across spatial and temporal scales, from individual animals to entire biomes, from instant events to eras. Readers hungry for new facts and familiar with Lomolino et al.’s Biogeography will possibly yawn over Kolbert’s book. However, for me the most inspiring were not the facts, but the author’s effort to directly experience and even physically touch her subjects, while still keeping the large-scale, synthetic and didactic perspective, combined with an almost novel-like feeling to the style. As such The Sixth Extinction is a great introductory book for students that are new to the field of conservation biogeography and extinction science, as well as it is an educative summer read for the general public. This is inaccurate as even extreme stress is a form of natural selection – the game has not changed, it just gets too fast. It is nevertheless daunting (and almost biblical) that extreme events exterminate even those life forms that appear successful and dominant. This motive appears throughout the whole book, and is mentioned even in the context of mammoths, hairy rhinos, and other big stuff. It also applies well to the pressure that we, humans, put on the current populations. To argue that the current extinction event could be averted if people just cared more and were willing to make more sacrifices is not wrong, exactly; still, it misses the point. It doesn’t much matter whether people care or don’t care. What matters is that people change the world (p. 218). Recent extinctions of amphibians and the spread of the Chytrid fungus Batrachochytridium dendrobatidis. The ascent of paleontology and the science of extinctions, with focus on Georges Cuvier and the discovery of mastodon skeletons. Charles Lyell, the discovery of plate tectonics and fluctuation of oceans, and how this influenced Darwin. The extinction of Great auk. Walter Alvarez and the impact event at the end of Cretaceous. Ammonite extinction, the scarcity of fossil record and fossilization potential. The sudden extinction of once dominant groups, e.g. Graptolites in the end-Ordovician extinction. History of the term anthropocene (coined by Paul Crutzen). Acidification of the oceans, its role in at least two mass extinctions, plus a very long list of reasons why it’s a major issue now (e.g. it increases the cost of calcification in corals by changing the saturation state of aragonite). Chris Langdon’s experiments with corals in Biosphere 2. Macroecological patterns such as latitudinal and altitudinal gradients, species-area relationships, and the ability of species to track changing climate. The message from artificial forest fragments in Biological Dynamics of Forest Fragments Project (BDFFP) in Brazil. Species invasions, homogenization of biota, and the bat white nose syndrome. Sumatran rhinos, ex-situ conservation, risks of being large and the lethality of low but steady pressure over prolonged time frame. Extinction of Neanderthals and Denisovans. Edgardo Griffith from EVACC on amphibians and the chytrid fungus. Neil Landmann from American Museum of Natural History on ammonite extinction. Jan Zalasiewicz from University of Leicester on stratigraphy and Graptolites. Jason Hall-Spencer from Plymouth University on ocean acidification. Stanford’s Ken Kaldeira on coral reefs. Miles Silman from Wake Forest University on elevation gradients and species tracking climate. Thomas E. Lovejoy on BDFFP plots and fragmentation of tropical forests. Mario Cohn-Haft on BDFFP birds. Al Hicks from NY Dpt. of Environmental Conservation on bat extinctions and the white nose syndrome. Svante Pääbo from Max Planck Institute on Neanderthals.